Heather is in a wheelchair, however, she is much improved. She took a few bunnies out for rides during the last show and they seemed to enjoy the adventure. It seemed to be a good way to give the rabbits a bit of fun. Auntie Heather has rented an accessible, one level apartment in the Campbell area to be near her bunnies and closer to Stanford Hospital where she will continue to receive medical care. Just a few more surgeries, and if all goes well, she'll be as good as new soon. There are certainly plenty of lucky bunnies that surround her as she recovers and many caring, supportive Rabbit Haven humans that are helping too. The great news is that Heather's vision and balance has improved and she is now able to walk short distances! She has returned to her administrative duties and is able to care for several rabbits under three pounds. Her custom made wheelchair allows excellent mobility and she looks forward to a speedy recovery including Occupational Therapy, Physical Therapy and support from Stanford Hospital. As always, she is encouraged to get well quickly by the many needy shelter and community rabbits waiting for care and by the loving, supportive network of rabbit caretakers and bunny advocates who surround her. Everyone associated with Heather is doing their part to help so she can be restored to perfect health. All Haven rabbits are safe and well cared for. However, to be able to rescue additional bunnies, we are in need of new foster sites now more than ever! Transport, cleaning crews and supply pick ups will also be appreciated. Thank you to all of you who sent get well cards, flowers, and emails during this tough time - It really helped! Heather sends her thanks and love to you! Special thanks to those who are fostering the special needs rabbits Heather had cared for. She waited to go in to the hospital until every rabbit was in temp foster care. Heather Bechtel, the director of The Rabbit Haven and a tireless advocate for rabbits everywhere, recently sustained a spinal cord injury that prevents her from lifting more than five pounds. 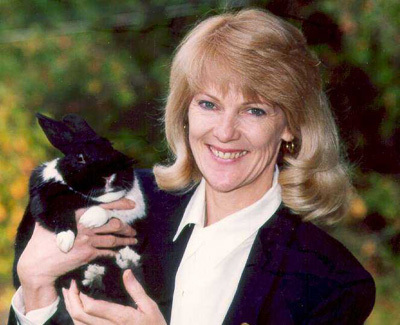 Before the injury, she was caring for 26 rabbits as well as doing her regular administrative duties. Some of these bunnies are large, and Heather will no longer be able to care for them because she cannot lift them. We are seeking foster homes that will be able to care for these larger bunnies. In addition, Heather will require help carrying bags of food and litter, cleaning pens and transporting larger rabbits. Any help in this area will be greatly appreciated as well. The bunnies in need of foster placement include a mom and litter recently rescued from certain death, special needs buns (including one facial trauma boy who comes with his own cuisinart! ), and various other sweet, beautiful bunnies who just need a place to stay and someone to look after them. Single and pairs are available. Heather will continue to perform all of her usual duties like answering questions about rabbit care, coordinating rescues and adoptions from The Haven, rabbit advocacy, etc. The strain of caring for 26 rabbits is just too much for her right now. The bunnies need help! If you can take a foster rabbit into your home, please contact Auntie Heather at director@therabbithaven.org or at (831) 239-7119.